Raymond Lee Boyd, 98, of Olathe, passed away on January 30, 2017. He was born on October 13, 1918 to Shelby and Margaret Boyd in Chula, MO. On May 6, 1940 he married the love of his life Enid Acree. They celebrated their 75th wedding Anniversary in 2015. Raymond was a wonderful husband, father, grandfather and great grandfather; a business owner; and an avid volunteer in his church. He was always willing to serve the church in whatever capacity the church deemed fitting. He was a member of the Olathe Lions Club and held several offices including President. Each year he’d help man the Lions booth at Old Settlers and volunteered at numerous pancake breakfasts and participated in other fund raising events for the organization. 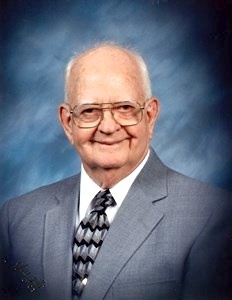 During his lifetime, he served in the Army in occupied Japan; worked for the Rock Island Railroad; was a residential and commercial electrician; farmed and raised cattle; was a “route man” for the Holsum Bread Company; worked at Olathe Lanes maintaining its machines, lanes and drilled bowling balls and co-owned the Boyd Athletic Lettering Company. Raymond was preceded in death by his parents, wife Enid Boyd, and daughter Brenda Donovan. He is survived by his two loving daughters Debra Zook (Joe) and Vickie Sizemore (Larry), three grandchildren, and seven great-grandchildren. The family will receive friends for a visitation on Friday, February 3, 2017, from 10:00 – 11:00 a.m. at the First Baptist Church of Olathe, followed by the funeral service at 11:00 a.m. Burial will take place in Oak Lawn Memorial Gardens in Olathe. In lieu of flowers, memorial contributions may be given to a charitable organization of your choice. Raymond Boyd is an example of a life well-lived with dignity, compassion and in service to other people. He loved his family, instructed us in the right way to do things, forgave us when we needed it, and gave us laughter. We miss you beyond description and will love you forever.